Sorry for the long silence on this blog. 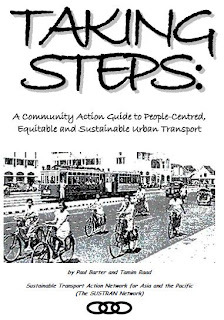 In 1999 and 2000, when I was living in Kuala Lumpur and working for the SUSTRAN Network, I collaborated with Tamim Raad to produce a little yellow book called "Taking Steps: A Community Action Guide to People-Centred, Equitable and Sustainable Urban Transport". The old URL for downloading Taking Steps is now dead, so here is a new one, via google docs. You can view or download the Taking Steps book here. The purpose of this guide is to introduce urban transport issues to a wider audience than just professional transport planners and experts. Many community organisations, journalists and decision-makers need to have some awareness of the basics of urban transport. This book tries to make it easier to find out those basics. Is the book badly dated? Not as badly as I had thought. I think I would handle various issues differently now. And it does have some out-of-date material such as the contact details listed at the end. Nevertheless, much of it still seems relevant. Thanks a lot for make this book available. I have learned a lot from it.